When penguins smell bad to humans, it's for the same reason that sweat and bodily wastes smell bad. Bodily secretions interact with bacteria, and the result is stinky. When it comes to a large colony of penguins and all that penguin poop, known as guano, the results escalate to a stench that human neighbors complain about. In the Antarctic Peninsula where the dwindling Adelie penguin population still numbers in the thousands, visitors get a nose full of guano smell even from a distance, the National Public Radio website reports. Picture a huge nursery filled with piles of dirty diapers. Penguin couples take turns sitting on their nests. One partner waddles off and swims out to eat, leaving the other on the nest; then the parents trade places. 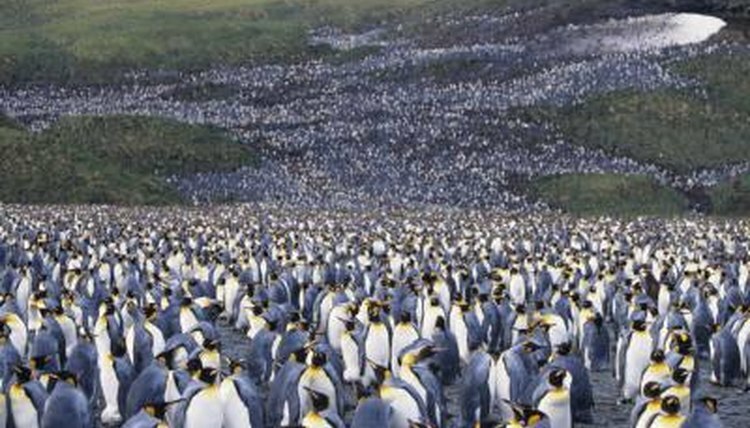 There are no bathrooms, so the whole population of penguins is pooping all over the nesting site. For penguins, it's their nature. For humans, it smells bad. A fish diet and global warming may contribute to the odor of penguin guano. Temperature increases decimate the Adelie penguin populations and melt the sea ice they require in their habitat. The guano smell in their colonies resembles old cigarette tobacco soaked in ammonia, mixed with rotten shrimp and left in the sun for days, NPR science producer Jason Orfanon reported from the Antarctic Peninsula. Penguin poop led to the discovery of a colony of emperor penguins in Antarctica. Satellite images revealed trails of poop, and researchers used it to find the 9,000 emperors. The colony's poop was visible from space, yet researcher Alain Hubert said the smell wasn't too bad because it was so cold, according to NPR. It seems scientists in polar climates at their coldest get a break from the smell -- and that even slightly warmer temperatures makes the smell really bad. Penguins don't smell bad to each other, and they may have such a keen sense of smell that they're able to detect their degree of relationship to another penguin to prevent mating with a relative. Captive Humboldt penguins smell each other and odor may be a factor in mate choice, according to results of a study published in Plos One. Keeping the smell down in Florida's SeaWorld Antarctica Empire of the Penguins attraction involves cleaning the air at the molecular level, lots of scrubbing and blowing in new snow daily, the Tampa Bay Times website reports.